Charles Pierre Baudelaire was a French poet who also produced notable work as an essayist, art critic, and pioneering translator of Edgar Allan Poe. His most famous work, Les Fleurs du mal (The Flowers of Evil), expresses the changing nature of beauty in modern, industrializing Paris during the 19th century. Baudelaire's highly original style of prose-poetry influenced a whole generation of poets including Paul Verlaine, Arthur Rimbaud and Stéphane Mallarmé among many others. 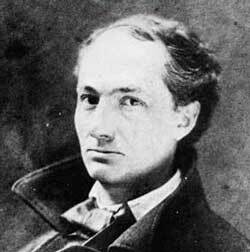 Charles Baudelaire is one of the major innovators in French literature. As for theme and tone, in his works we see the rejection of the belief in the supremacy of nature and the fundamental goodness of man as typically espoused by the romantics and expressed by them in rhetorical, effusive and public voice in favor of a new urban sensibility, an awareness of individual moral complexity, an interest in vice (linked with decadence) and refined sensual and aesthetic pleasures, and the use of urban subject matter, such as the city, the crowd, individual passers-by, all expressed in highly ordered verse, sometimes through a cynical and ironic voice. Baudelaire’s father, who was thirty years older than his mother, died when the poet was six. Baudelaire was very close with his mother (much of what is known of his later life comes from the letters he wrote her), but was deeply distressed when she married Major Jacques Aupick. In 1833, the family moved to Lyons where Baudelaire attended a military boarding school. Shortly before graduation, he was kicked out for refusing to give up a note passed to him by a classmate. Baudelaire spent the next two years in Paris’ Latin Quarter pursuing a career as a writer and accumulating debt. It is also believed that he contracted syphilis around this time. In 1841 his parents sent him on ship to India, hoping the experience would help reform his bohemian urges. He left the ship, however, and returned to Paris in 1842. Upon his return, he received a large inheritance, which allowed him to live the life of a Parisian dandy. He developed a love for clothing and spent his days in the art galleries and cafes of Paris. He experimented with drugs such as hashish and opium. By 1844, he had spent nearly half of his inheritance. His family won a court order that appointed a lawyer to manage Baudelaire’s fortune and pay him a small “allowance” for the rest of his life. To supplement his income, Baudelaire wrote art criticism, essays, and reviews for various journals. In 1854 and 1855, he published translations of Edgar Allan Poe, whom he called a “twin soul.” His translations were widely acclaimed. In 1857, the first edition of The Flowers of Evil was published. Six of the poems, which described lesbian love and vampires, were condemned as obscene by the Public Safety section of the Ministry of the Interior. The ban on these poems was not lifted in France until 1949. The Flowers of Evil, with its explicit sexual content and juxtapositions of urban beauty and decay, only added to Baudelaire’s reputation as a poéte maudit (cursed poet). In 1862, Charles Baudelaire began to suffer nightmares and increasingly bad health. He left Paris for Brussels in 1863 to give a series of lectures, but suffered from several strokes that resulted in partial paralysis. On August 31, 1867, at the age of forty-six, Charles Baudelaire died in Paris. Although doctors at the time didn’t mention it, it is likely that syphilis caused his final illness. His reputation as poet at that time was secure; writers such as Stephane Mallarmé, Paul Verlaine, and Arthur Rimbaud claimed him as a predecessor. In the 20th century, thinkers and artists as diverse as Jean-Paul Sartre, Walter Benjamin, Robert Lowell and Seamus Heaney have celebrated his work.